The Bayh-Dole Act of 1980 (which is a part of the Patent Act - 35 U.S.C. § 200-204) provides universities, non-profits, and small businesses with the ability to retain title to a “subject invention” developed under federally sponsored contracts. Under the Bayh-Dole Act, a small business, non-profit or university can use government-funded research to develop an invention, and retain title in a patent based on the “subject invention” (as defined in the Act). The goal of the Bayh-Dole Act is to use “…the patent system to promote the utilization of inventions arising from federally supported research or development; to encourage maximum participation of small business firms in federally supported research and development efforts; to promote collaboration between commercial concerns and nonprofit organizations, including universities; to ensure that inventions made by nonprofit organizations and small business firms are used in a manner to promote free competition and enterprise without unduly encumbering future research and discovery; to promote the commercialization and public availability of inventions made in the United States by United States industry and labor; to ensure that the Government obtains sufficient rights in federally supported inventions to meet the needs of the Government and protect the public against nonuse or unreasonable use of inventions; and to minimize the costs of administering policies in this area." 35 U.S.C. § 200. Under the Bayh-Dole Act, title to any resulting patents covering the “subject inventions” can be retained by the developing entity (i.e., the government contractor) subject to government rights. What this means, from a practical standpoint, is that a federal contractor who retains title to a “subject invention” can pursue a patent application covering the subject invention, and take title to the resulting asset. The contractor is also free to transfer or license the patented technology, subject to the government’s rights in the patent. That caveat can be a big deal. Although the government contractor has the primary claim to the subject invention, the U.S. government maintains rights even after, for example, the transfer of the patent to another party (e.g., through a patent sale). These rights include special “march in” rights that allow the federal government to retain a license for its own use, along with the right to grant licenses to other parties, particularly for military applications and areas of public safety. The march-in rights also provide the government discretion to grant a license to, for example, the contractor’s competitors. While these special “march in” rights can be onerous, particularly in the case of a license to a competitor, the use of the government’s license is limited to areas of special interest to the federal government, which may not necessarily involve direct competition with the patent owner in the marketplace. An example of a scenario involving march in rights may be as follows. Suppose a small business contractor in a particular Artificial Intelligence (AI) field develops a new AI product as part of a contract with both the U.S. Army and DARPA under a federally sponsored research and development contract. The contractor then files a number of patent applications covering “subject inventions” related to the developed software, and assigns the patent applications (and resulting issued patents) to its business (e.g., a Limited Liability Company). A few years later the issued patents are sold by the LLC to a wireless telecommunications company as part of a patent acquisition. The new patent owner -- the telecom company -- now has title to the patents and can freely utilize the patented technology in its wireless products and services. 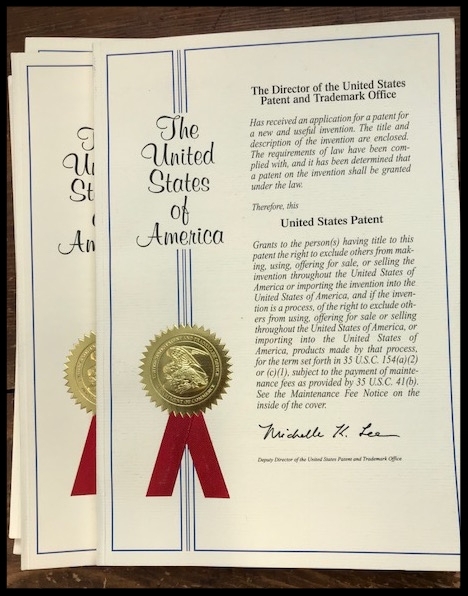 The new patent owner may even choose to not practice the patented technology and instead, may hold the patents for defensive purposes or assert the patents against potential infringers (e.g., via a licensing program, litigation, etc). The fact that the government has certain rights in the patents does not alter the wireless telecom’s ability to sell or license its rights to the patents. Although title issues, such as the federal government’s “March-In Rights,” may be tied to patented innovations developed with government funding, the benefits to a contracting entity often outweigh such risks. The benefits include a source of income (via the federal contract) during the research and development phase of a new technology, along with the ability to seek patent protection for innovations created under the government contract. For small businesses, and start-ups in particular, a government contract can be a financial “shot in the arm” that may also result in the development of valuable intellectual property assets that can be later sold, licensed, or strategically held as part of an organization’s intellectual property portfolio. The meteoric rise of cryptocurrency has fueled a related uptick in blockchain patent filings. A recent search of the U.S. Patent & Trademark Office’s patent application database revealed 176 blockchain related U.S. patent applications published in the first and second quarters of 2018. 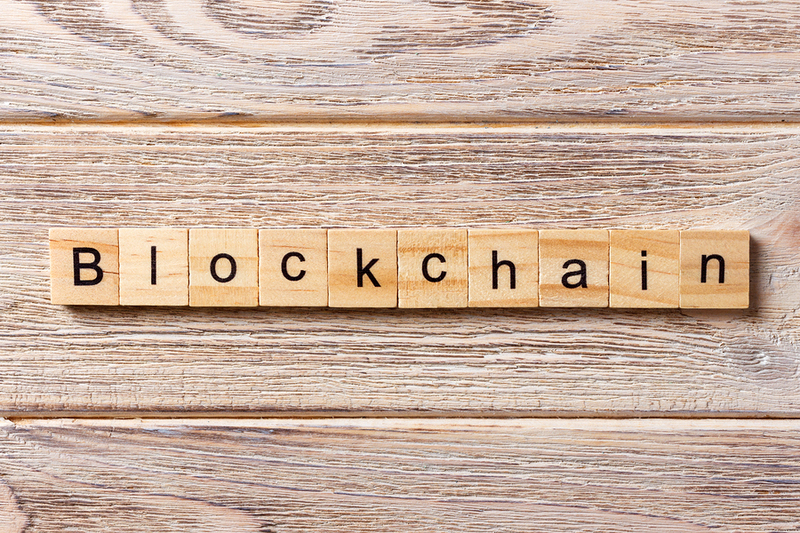 What began as a trickle of blockchain related filings in 2014, has transformed into a deluge, indicative of the impending race for blockchain patent supremacy. Organizations ranging from financial institutions such as MasterCard and PayPal, to traditional technology companies such as Intel and IBM, and even automotive companies such as Ford Motors are vying for a piece of the pie. The challenge facing patent practitioners attempting to obtain patent coverage for their clients in the blockchain space, is subject matter eligibility under 35 U.S.C. 101, especially in light of the 2014 Alice v. CLS Bank decision by the U.S. Supreme Court. The “Alice” decision established a two-part test for finding patent claims ineligible. The test has proven difficult to navigate, particularly for software related technologies. After the Alice decision was handed down, many expected that patents directed to computer-implemented financial methods would be “dead on arrival” given their reliance on software. This, however, has turned out not to be the case. Although numerous patents have been invalidated in the last several years, the tide may be turning. Post-Alice, the Court of Appeals for the Federal Circuit (CAFC) has, in several cases, found claims directed to software with an “algorithmic” emphasis patent eligible. For example, the court in Enfish, LLC v. Microsoft Corp., 822 F.3d 1327, 1335 (Fed. Cir. 2016) held claims for a “self-referential data table” eligible and discussed how the Enfish approach improved the functioning of the computer itself. The court in Finjan, Inc. v. Blue Coat Systems, Inc., Appeal no. 2016-2520 (Fed. Cir. Jan. 10, 2018), held claims covering a computer virus scan for generating a security profile identifying both hostile and potentially hostile operations patent eligible. In addition, the court in DDR Holdings, LLC v. Hotels.com, L.P., 773 F.3d 1245 (Fed. Cir. 2014), found claims to the “look and feel” of a website eligible, and the court in Trading Tech v. CQG, No. 2016-1616 (Fed. Cir. 2017), found claims eligible for a graphical user interface that prevents an order entry at a revised price. These are but a few of the decisions since 2014 where software related patents have been found patent eligible. What these decisions mean from a practical standpoint is that care should be taken in drafting blockchain related patent applications to ensure that the claims contain subject matter in line with such decisions. These cases (and others now winding their way through the courts) offer guidance to practitioners on the kind of language and features that should be included in claims to improve the chances of surviving an “Alice” rejection during prosecution and/or, litigation. In the case of blockchain technology, the blockchain ledger itself (e.g., an improved blockchain ledger) may be patent eligible in a manner similar to the “self-referential data table” in Enfish. The specification should include language describing how the claimed blockchain subject matter actually improves the functioning of the computer, or network, (e.g., by improving processing time, etc.). Unique graphical user interfaces and GUI features that facilitate a blockchain transaction may also be patent eligible, in line with the decision in DDR Holdings. Despite the holding in Alice, the decisions applying the Alice test suggest the chances of both obtaining blockchain related patents and successfully enforcing them in years to come is improving. The Eligibility Quick Reference Sheet is one of many helpful patent resources available from the U.S. Patent & Trademark Office. 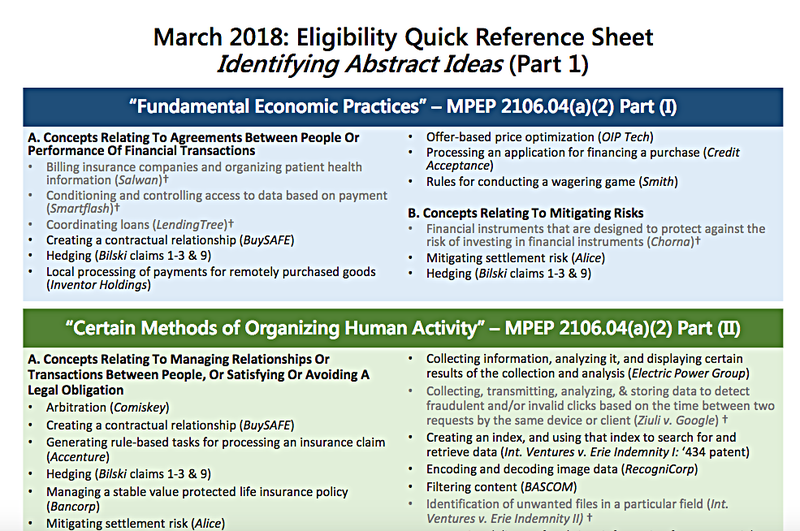 The U.S. Patent & Trademark Office recently released an updated (March 2018) Eligibility Quick Reference Sheet. While this serves as a guide for patent examiners, it is also a helpful resource for patent attorneys and agents faced with eligibility rejections under 35 U.S.C. § 101. This is of increased value in light of the 2014 Alice v. CLS Bank decision. The Eligibility Quick Reference Sheet categorizes patent eligibility decisions by outcome, identifying cases where the claims were found ineligible according to the Alice test (i.e. directed to an “abstract idea” and “not offering significantly more”), contrasted with cases where claims were found patent eligible. The first two pages offer guidance in identifying “abstract ideas,” by providing exemplary decisions where claims were directed to “Fundamental Economic Practices,” “Certain Methods of Organizing Human Activity,” “An Idea ‘Of Itself,” and “Mathematical Relationships / Formulas.” Although the descriptions are brief, the synopsis of each category of abstract idea is a convenient starting point for evaluating the merit of a rejection. The third page of the reference sheet outlines court decisions holding claims eligible according to both steps of the Alice decision. This is particularly useful for patent practitioners facing an Alice rejection under 35 U.S.C. § 101. For example, in the face of an Alice rejection, a ready list of cases where claims have been found eligible is available for review. Comparing the claims under prosecution to those from cases outlined in the reference sheet, provides a number of useful avenues for argument or amendment. Likewise, a review of patent eligible claims will help patent drafters craft claims sets that avoid potential eligibility issues altogether. In-house intellectual property (IP) legal teams are increasingly faced with the task of meeting the IP research needs of their internal clients (e.g., business units, technology transfer groups, etc) while staying on budget and controlling expenses. In identifying potentially patentable inventions, one preliminary step is to conduct a prior art search. Some organizations hire outside patent research firms for searching services. Others use proprietary patent research tools that provide sophisticated patent mapping to handle this task. While these approaches can provide a strategic patent overview), the associated tools and resources are expensive. This adds more constraints to an already tight IP budget. Fortunately, there are several free platforms available via the Internet to alleviate the initial expense of up front IP research. The first step in any initial IP evaluation should include the USPTO (U.S. Patent & Trademark Office) website. The USPTO offers a number of free and useful resources including the “USPTO Patent Full Text & Image Database” and the “USPTO Patent Application Full-Text & Image Database”. Both resources are freely available at the USPTO’s website. For new searches, the USPTO website even offers a step-by-step strategy for your preliminary research. A simple keyword patent search can be performed quickly using these two free patent resources. The USPTO’s electronic, searchable database, known as “PAIR,” (Patent Application Information & Retrieval) is another invaluable resource. PAIR allows an IP researcher to view and download the complete prosecution file histories of U.S. patent applications and issued patents. These tools, used in combination, are powerful. For example, a user can identify relevant prior art with the “Full Text Database,” and make note of the patent application serial number or patent number of the reference. Then the searcher can use PAIR to retrieve the entire prosecution file wrapper of the identified reference, which provides details regarding how the patent was prosecuted, and ultimately issued. Another free resource is Google Patents. Unlike the USPTO databases, which only provide information on cases filed in the U.S., Google Patents contains a treasure trove of international patent applications and issued patents including patents from Europe, China, Japan, and so on. While Google provides a user-friendly and comprehensive research tool, caution is required when using Google. Google is under no obligation to protect proprietary or confidential information entered by a user. As such, users should be mindful of the material they enter when using Google for searching, particularly when the subject matter is not yet publicly available. Finally, the WIPO (World Intellectual Property Organization) offers a free “Patentscope” research tool. Patentscope allows a patent research to review the WIPO’s vast index of international filings. The WIPO search tool can be used to search, not only the PCT database of 2 million plus international applications, but worldwide patent collections as well. These free tools provide access to a vast and rich collection of patent documents and information, and can be used by your IP group to save on upfront patent research costs. In-House intellectual property (IP) attorneys are tasked with a difficult job. They are expected to build an intellectual property portfolio that adds significant value to their company or organization, and with a limited budget. In addition, the in-house counsel is expected to deliver a high quality low cost portfolio while addressing the desires, an IP “wish list” so to speak, from their assigned business units. For example, it is not uncommon for in house counsel to be asked to deliver on ambitious plans to increase patent filings originating from their engineering staff, with a decreasing budget. The in-house intellectual property counsel is therefore faced with the increasingly difficult job of effectively delivering IP services while balancing often contradictory or competing corporate mandates. A key to successfully delivering in-house IP services is the selection of outside counsel. A critical factor is the experience of the attorneys in an outside firm. For example, can the outside firm really appreciate what it takes to secure and manage intellectual property in-house? How many years of experience do the outside attorneys have? Will a first-year associate be drafting patent applications, or will a more experienced attorney, who is well versed in the art of patent preparation and prosecution, be handling the caseload? Finally, is the outside firm flexible enough to adapt their billing arrangements and procedures to make the life of the in-house IP attorney easier? Attorneys at OL Patents have served as both in-house and outside intellectual property counsel, and have first-hand experience with these issues. Luis Ortiz has served as in-house counsel with the U.S. Department of Energy, Xerox Corporation and Nortel. Kermit Lopez was in-house intellectual property counsel for Sandia National Laboratories and Ericsson Inc. Luis and Kermit agree that one of the main challenges they faced as in-house attorneys was managing a dynamic patent portfolio that involved securing patent filings within a particular budget. To this end, OL Patents will meet the IP needs of your in-house intellectual property group by providing more than 60 years or combined experience, competitive rates, and simplified billing. For example, we offer traditional hourly billing, with a not-to-exceed or flat fee option, or complete flat fee patent filing services. Your in-house intellectual property group can deliver high-quality intellectual property services on budget, by choosing the right outside counsel, like the experienced intellectual property attorneys at OL Patents.